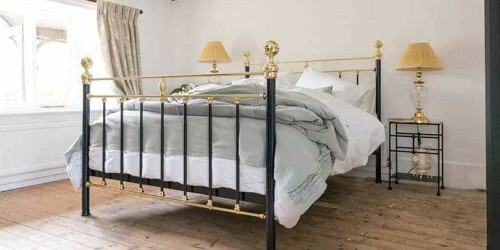 George Small Double & 4 Foot Iron & Brass Bed | Wrought Iron & Brass Bed Co.
Our George 4 Foot Iron & Brass Bed offers a beautiful classic Victorian style which is by far one of our most commanding and distinguished bed ranges to date. With impressive hand crafted brass finials that are 3 inches in diameter and hand formed brass cufflinks, to finish each solid brass bar. 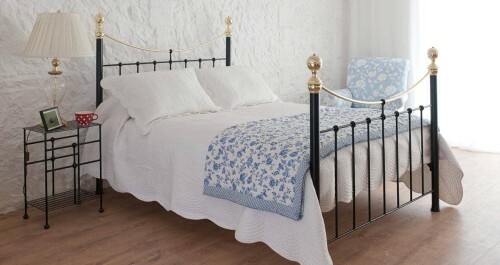 George could be described as a true luxury hand crafted bed. 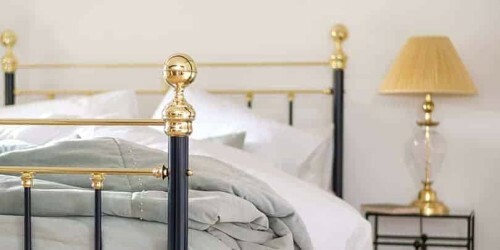 Our George iron and brass bed range is available in a variety of colours and finishes. Pictured here is our Ivory and Brass. 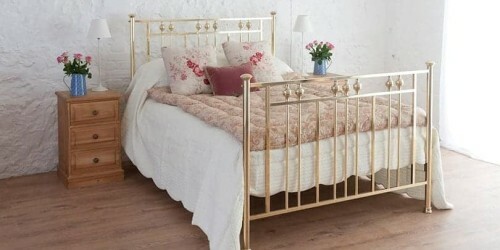 Check out our full range of iron beds and even brass and nickel beds to find your perfect bed today.  Read more about our finishes. Our Ivory, could classed as many colours, but most commonly “Pepper White”, “Soft White” and “Off White”.Mixed with Nickel Finials, creates a very contemporary look. 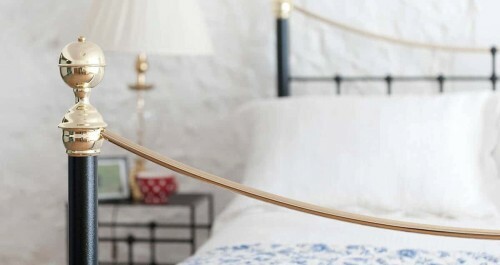 But mixed with Self-Colour or Brass Finials, our Ivory makes a subtle and timid bedroom statement. What can I say about our Black? Fabulous (although I’m perhaps a little biased)! 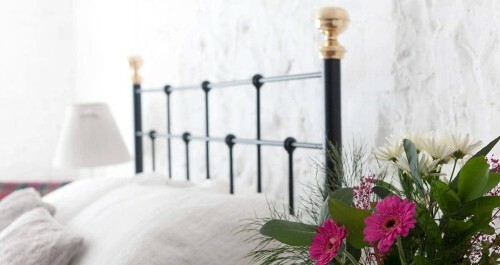 A timeless image – Black and Brass is an age-old classic. Our Cream is a very rich clotted cream colour, we would say on the custard spectrum. 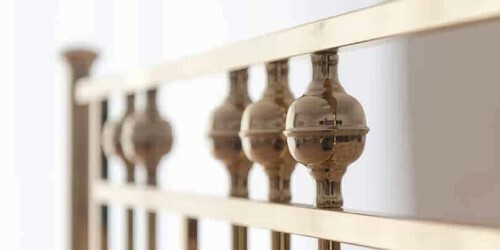 Teamed with Brass, our Cream can give a fresh new look to a very traditional style. When examined closely, its distinctive grungey appearance reveals itself to be a beautifully subtle palette of metallic greys and blues with dark undertones. And intriguingly, the colours continue to change post-production – with different shades appearing throughout the day as the temperatures surrounding the bed e.g. from sunlight or central heating vary. A combination between navy & black, this heritage colour has great depth. In brighter rooms the natural light will enhance the navy tones of Midnight Blue, whilst a darker setting will bring out the rich black tones. 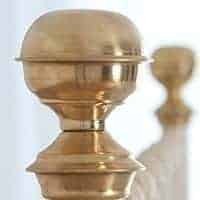 Our Brass Bed Knobs are hand turned in Fakenham, Norfolk. Using a very old technique, these finals are formed into our delicate and stunning bed knobs.As these are natural brass, over time the will age. Developing beautiful, ‘rustic’ and tarnished tones of brass. But to keep them looking fresh, just a weekly wipe with a duster; or a good clean with some brass cleaner, will do the trick. 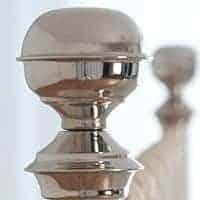 No matter what you colour choice, our Nickel Bed Knobs, have the ability to turn any style and colour, into something very contemporary and wonderful.Just a weekly dust, will keep these dazzling finials, looking like the day you got them. Our slats are by no means skinny! Nor are they like any you’ll find on the high street!15cm wide and 3?4 inch deep, are made from natural wood… and not wood dust glued together. 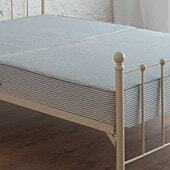 These solid slats will stand the test of time.And don’t worry that our beds don’t have a 5 leg or a middle support!!! That’s because our frames are made to last, and so are our slats!! 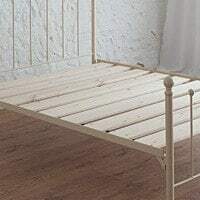 Our Un-Sprung Bed base is a great way, to make more of a statement with your hand made iron bed.Designed to help maintain the quality of your mattress, by creating an equal distribution of weight. Our side rails are placed 13″ from the floor, so remember a bed base, will increase the height of where your mattress will sit. .If you would like to lower your side rails, please call us on 01485 542516, to place your order and we can discuss your options. 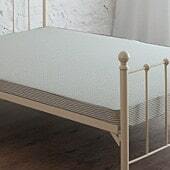 Imagine Bed Knobs and Broom Sticks, or The Princess and The Pea… and that is roughly how our beds look, with a sprung bed base on.Designed to help maintain the quality of your mattress, by creating an equal distribution of weight.Our side rails are placed 13″ from the floor, so remember a sprung bed base, will the height to where your mattress shall sit.If you would like to lower your side rails, please call us on 01485 542516, to place your order and we can discuss your options.